I also had another look at the pictures you drew they are eally really good hope my textiles drawing turn out as nice maybe you could give me some ideas? Man, I would love to visit there! So beautiful! You have some of the raddest facial expressions! 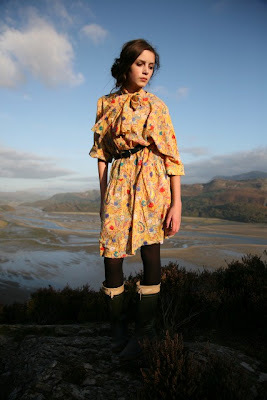 :) The dress and boots are so fitting for the surroundings! 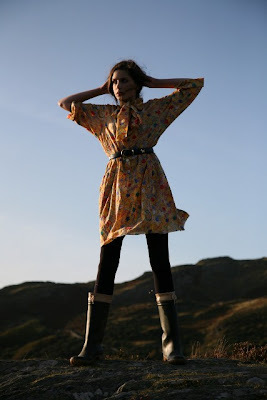 Great photos; I adore the dress paired with those boots! Wow, I love this set, so gorgeouss! such nice comments on your sketches! the light in these pics is sooo pretty with that epic landscape. and i like how you've styled the dress. This is such a pretty dress and I love the first and last couple of photos. Love your blog. Yay Jaegar! Love it so much! Your customising really works I'd never have guessed if you hadn't said. The comments from all the bloggers are really sweet, and of course quite true, that really was such a creative post! Your pictures are so beautiful . I am jealous of the beautiful scenery. Makes me want to jump on a train and get out of London . Next time you visit London be sure to check it out and (if you haven't seen on the news already) the huge black box in the Tate Modern..
also just so you know, this is my favorite blog that I have seen so far! I just started blogging a few weeks ago and this is really just an amazing blog! 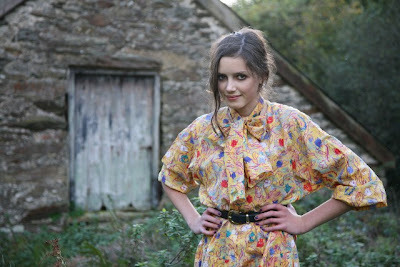 14 and so talented with choice of clothes, styling, hair, everything. This is crazy! 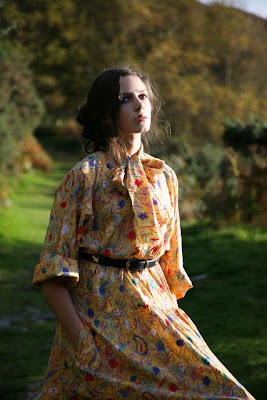 Love your dress, the print is fab' ! Wow pictures are so beautiful, the landscape is just so amazing ! This is so Beautiful and inspirational! 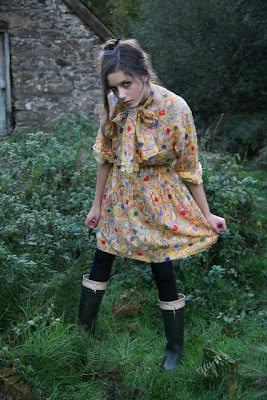 I love your style and these pictures are lovely! I am a new blogger so I have only seen a few sites but this is the best. That you are so young and already following your dreams is so cool:) keep up the great work! And thank you for the great blog :) I most definately think you will go places with your talent. Hey from Canada! Woooow, definitely my new favorite blog! Absolutely everything about it is perfect, including the person wearing the clothes:) AND, I love that most of your clothes are recycled. It think your fellow bloggers (ahem, S of S) should follow your example. You symbolize everything that is RIGHT about fashion! I think you must seriously live in the most beautiful place on earth!! 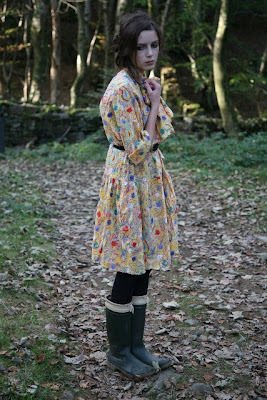 Love the feminine dress paired with the wellies. Also, beautiful scenery in your photos. Cool pictures, the background is stunning! hey girl! 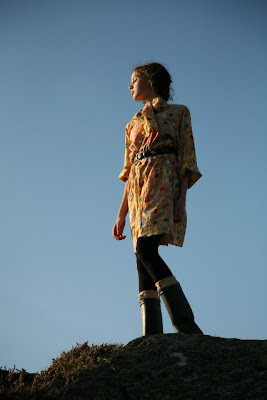 long time no speak:) very lovely photos, i adore the lighting, scenery, and MODELING in each one! as to your debate, i must agree with you. 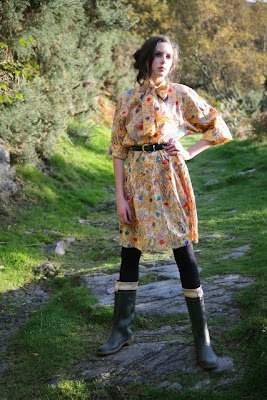 i for one also wear vintage quite often and i hardly ever buy new. i do say i 'lust' after things, but i really dont think it counts too much. What a beautiful dress! and I just happen to fall in love with the place, over looking like that. OMG wish i was there. It's really pretty. this is so much like an editorial.the light, the decor, the clothes ....beautiful. 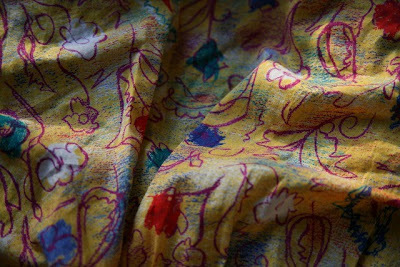 What a find was the gorgeous Jaeger print and bokeh from the 5D makes your well-chosen settings that much dreamier.